An implantable pump is a technologically advanced drug delivery system or device implanted beneath the skin to administer a steady dose of drug or fluid. These pumps are used to deliver anti-spasmodic, chemotherapeutic agents, and opioid drugs. 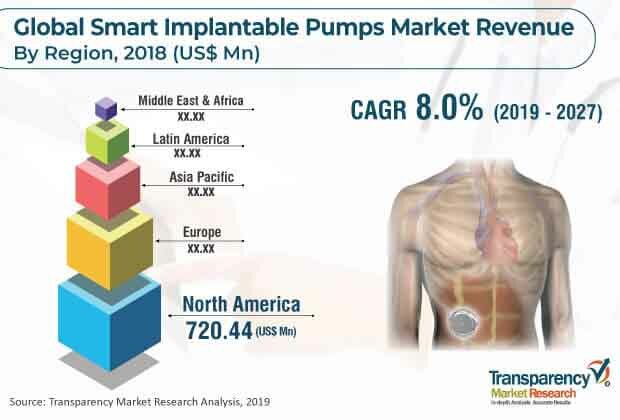 The global smart implantable pumps market was valued at US$ 1,332.42 Mn in 2018 and is projected to expand at a CAGR of 8.0% from 2019 to 2027. Smart implantable pumps are widely used in the treatment of pain & spasticity, pulmonary arterial hypertension, and heart failure. Technological advancement in implantable pumps is likely to boost the growth of the global market in the near future. The global smart implantable pumps market has been segmented based on type, application, end-user, and region. In terms of type, the market has been bifurcated into perfusion pumps and micro-pumps. The perfusion pumps segment is projected to account for leading share of the global market during the forecast period owing to wide adoption of these devices, especially Medtronic’s Synchromed II Pump. Technological advancements in perfusion pumps are anticipated to boost the growth of the segment during the forecast period. Based on application, the global smart implantable pumps market has been divided into pain & spasticity and cardiovascular. In terms of end-user, the market has been classified into hospitals, ambulatory surgical centers, and others. The hospitals segment is expected to expand at the highest CAGR during the forecast period owing to increase in the number of visits and longer stay in hospital, favorable reimbursement policies, and rise in the number of implantable procedures performed in these settings. Geographically, the global smart implantable pumps market has been segmented into five major regions: North America, Europe, Asia Pacific, Latin America, and Middle East & Africa. North America and Europe accounted for major shares of the global market in 2017. High prevalence of chronic diseases such as spasticity and chronic pain and presence of a large geriatric population that is more prone to chronic diseases drive demand for smart implantable pumps in these regions. The smart implantable pumps market in Asia Pacific is projected to expand at a high CAGR during the forecast period. Increase in incidence of cardiac diseases and other chronic diseases and rise in health care expenditure are anticipated to propel the market in the region during the forecast period. Key players operating in the global smart implantable pumps market include Medtronic, plc, Tricumed Medizintechnik GmbH, Flowonix Medical, Inc., Abbott, Berlin Heart, and others. These companies have established their presence in the market and enjoy brand loyalty among customers. These have diverse product offerings and extensive distribution systems across the world. Moreover, entry of small players has been witnessed especially in the emerging markets in Asia. However, stringent regulatory framework and high-quality standards set by the market leaders are anticipated to restrain the penetration of new entrants in the market. This report analyzes the current and future scenario of the global smart implantable pumps market. Increase in the geriatric population, high prevalence of chronic diseases, and rise in adoption of smart implantable pumps are the major drivers of the global market. The global smart implantable pumps market report comprises an elaborate executive summary, which includes a snapshot that provides information about various segments of the market. It also provides information and data analysis of the global market with respect to segments based on type, application, end-user, and region. A detailed qualitative analysis of drivers and restraints of the market and opportunities has been provided in the overview section. Additionally, the section comprises competitive matrix and company profiles with business overview to understand the competitive landscape in the market. This section of the report also provides market attractiveness analysis by region and market share analysis by key players, thereby presenting a thorough analysis of the overall competitive scenario in the global smart implantable pumps market. The global smart implantable pumps market can be segmented based on type, application, end-user, and region. In terms of type, the market can be bifurcated into perfusion pumps and micro-pumps. The perfusion pumps segment is projected to account for leading share of the global market during the forecast period owing to wide adoption of these devices, especially Medtronic’s Synchromed II Pump. Technological developments in perfusion pumps are estimated to boost the growth of the segment during the forecast period. Based on application, the global smart implantable pumps market can be divided into pain & spasticity and cardiovascular. In terms of end-user, the market can be classified into hospitals, ambulatory surgical centers, and others. The hospitals segment is anticipated to expand at the highest CAGR during the forecast period owing to increase in the number of visits and longer stay in hospital, favorable reimbursement policies, and rise in the number of implantable procedures performed in these settings. The market size and forecast for each of these segments have been provided for the period from 2017 to 2027, along with their respective CAGRs for the forecast period from 2019 to 2027, considering 2018 as the base year. Geographically, the global smart implantable pumps market has been segmented into five major regions: North America (the U.S. and Canada), Europe (the U.K., Germany, France, Spain, Italy, and Rest of Europe), Asia Pacific (India, China, Japan, Australia & New Zealand, and Rest of Asia Pacific), Latin America (Brazil, Mexico, and Rest of Latin America), and Middle East & Africa (South Africa, GCC Countries, and Rest of Middle East & Africa). The market size and forecast for each of these regions and countries/sub-regions have been provided for the period from 2017 to 2027, along with their respective CAGRs for the forecast period from 2019 to 2027, considering 2018 as the base year. The research study also covers the competitive scenario in these regions. The report also profiles major players in the global smart implantable pumps market based on various attributes such as company overview, financial overview, product portfolio, business strategies, and recent developments. Key players in the global smart implantable pumps market are Medtronic, plc. Tricumed Medizintechnik GmbH, Flowonix Medical Inc., Abbott, and Berlin Heart, among others.